The Vivid Brights Coloured Liquid Liners come in a small, rectangular shaped box. The box comes in glossy, black packaging with white writing. The box states that the eyeliner contains 0.06fl.oz/2ml of product. Each box has colouring according to the shade of liner inside, from the tab at the top of the box to the picture of the liner on the front. I like that feature, in that as well as looking lovely, it makes it easier to pick out the shade you are looking for without making a mistake. The back of the Vivid Brights Coloured Liquid Liner has two pictures to give you ideas for different styles of liner looks using the product. The first picture shows a more traditional style of liner, titled the ‘Classic Beauty Look’, whilst the second picture has an editorial style called the ‘Avant Garde Look’. You can of course apply the liner in any way you like, whether you prefer a thin, very natural style of line, more of a flicked out look (like in the first picture) or a stronger effect. The liner comes packaged in a slimline tube with a black lid and a coloured base. The lid section contains the liner applicator, whilst the coloured base stores the product. The coloured base matches the shade inside, which makes it easy to pick the product out from your make-up collection. The coloured base provides the product name, shade name and volume. 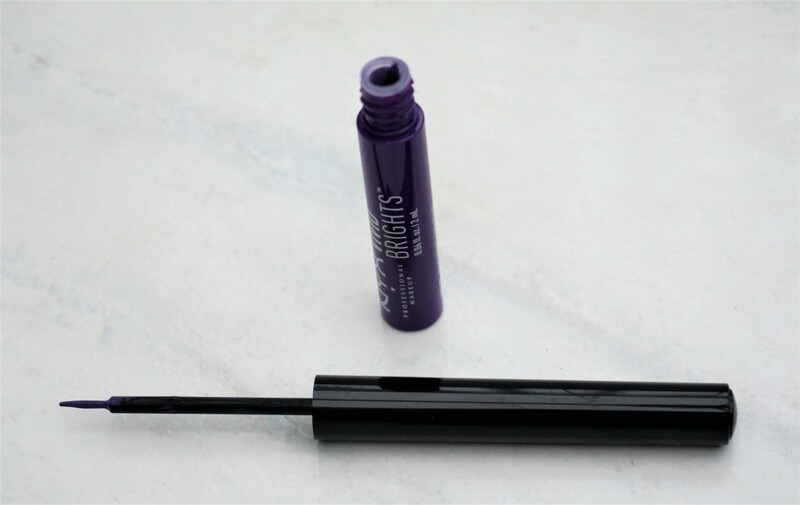 The liner applicator is fairly long in length, which I find makes it easy to hold (as if you were using a pen) when applying the liner. The liner section seems to be well-balanced length wise too, as it’s not too long and unwieldy or too short and hard to angle. The brush tip is very thin and relatively long. I find that the style and length of the brush tip makes it easier to get a very thin line (if that is the look you are going for). You can also use the brush tip to get a thicker line if you build it up or apply more product. There are nine shades available (in the UK), ranging from vivid pastels (light yellow, lime green, pale pink, lilac) and deeper pops (purple, blue, green, orange, red). I picked up one of the deeper colour tones, Vivid Violet. Purple is one of my favourite make-up colours and I really love the intensity of Vivid Violet. Vivid Violet is a deep, cool-toned violet-purple shade. I think that this colour is beautiful as a ‘pop’ of colour against neutral eyeshadow looks and as a standout shade with colourful eyeshadow combinations. The liner looks quite shiny when it is first applied and then dries down to a matte finish. I find that this liner lasts all day and maintains its vibrancy as well. The liner is also easy to remove with an eye make-up remover (my favourite is the Nivea Visage Eye Make-Up remover). I have been playing around with this eyeliner and came up with this combination. 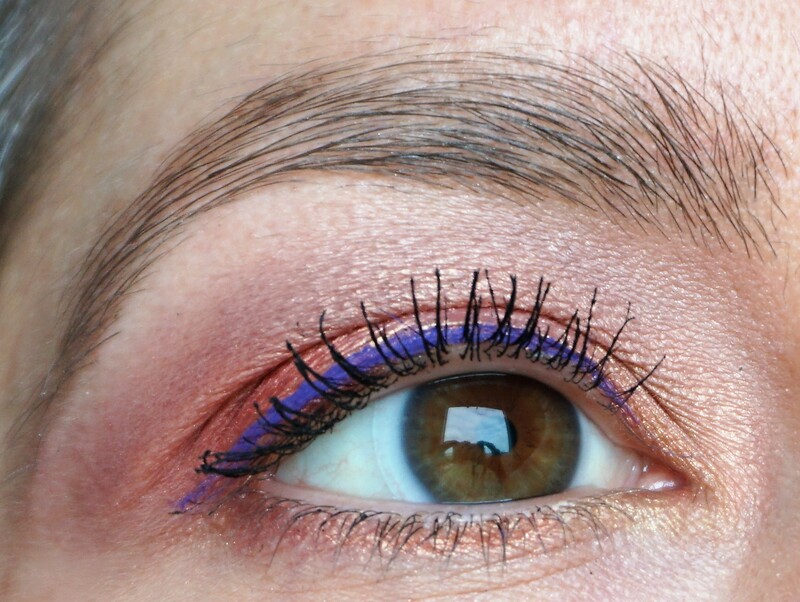 I really like how the vivid violet liner pops out against the coral tones elsewhere on the eye. You can read more on how to re-create this look here. NYX Vivid Brights Coloured Liquid Liners cost £5.50 and are available from Boots, Cult Beauty, Feel Unique and Debenhams. 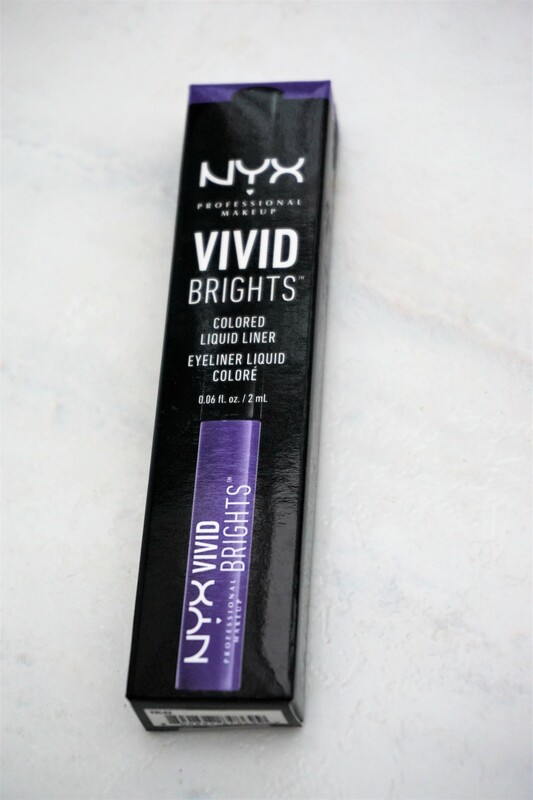 Have you tried the NYX Vivid Brights Coloured Liquid Liners before? What are your thoughts on this product? Any other NYX products you would recommend? Let me know your thoughts in the comments section below. Any top 5 colours to suggest! Great question, Pearl! It depends if you want a simple bold ‘pop’ of colour along the lashline or if you want a more pastel-based look. I gravitate towards the bolder shades but I think the pastel ones are really interesting too. I think the bolder brights, like Vivid Violet (purple), Sapphire (deep blue) and Envy (bright green) might be a little easier to wear, as they give a lovely bold ‘pop’ to the eyes. You can just apply a slick of the liner along the upper lashline, some mascara and you are good to go! I think the pastels like Escape (pale yellow-lime green) and Petal (pale pink) are beautiful but might be a little harder to wear if you aren’t used to coloured make-up. Pastel liners sometimes need a little ‘grounding’ to define the eye since they are so pale in tone. I would suggest applying a very fine line of black liner as close to the lashes as possible when wearing a pastel liner to really make your eyes stand out, followed by some mascara. That sort of look can be super pretty! It’s worth experimenting, though, as you might love the look of the pastel liner on its own without any black liner to ‘ground’ it.